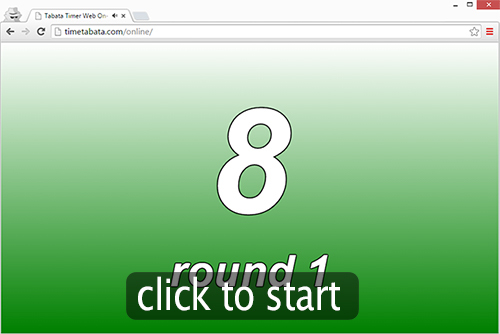 Tabata Timer Web Online - is a simple timer that runs in a Web browser. There is nothing to download and install. Just press start and running. Good for those with slow Internet speed connection. Timer supports all popular web browsers. It publishes every second timer beep at the beginning and at the end of the round timer publishes coaching whistle. The total volume of the timer is 106 KB. Familiar design and simplicity will help you enjoy the Tabata and achieve your goals.